The first time I went to Disneyland was as an adult with my husband. Even though we didn’t have kids at the time, we did venture into Fantasy Land and ride one ride: It’s a Small World. 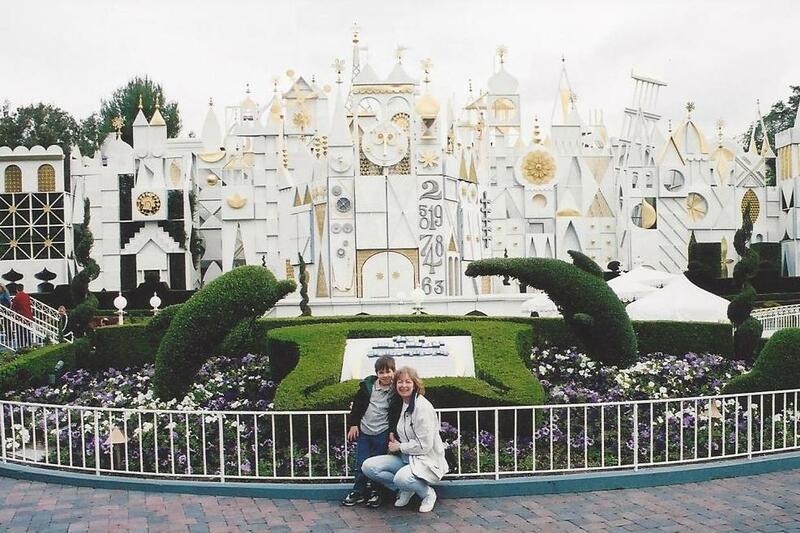 At ‘It’s a Small World’, April 2003. I know that people love that song and that ride, but after listening to that song repeat over and over again throughout the ride, I couldn’t get the music out of my head—even though I wanted too. (It’s no wonder; the ride was over ten minutes long.). Despite that I did make a sacrifice to my mental health and take my kids on the ride on a future trip to Disneyland. The 50th anniversary of the opening of that ride was earlier this year. Not that I follow those sorts of things, but I ran into someone who actually worked behind the scenes on that ride at Disneyland. She was so excited about the anniversary. I didn’t have the heart to tell her it didn’t conjure up pleasant memories for me. Below is a short video marking the 50th anniversary. All of this is just fodder for what I really wanted to write about. In all seriousness, it really is a small, small world. It has become that way for me anyway over the last few years. Of course, I am referring to my Spanish connection. It seems that after Pedro entered our lives in 2010, references to Spain kept crossing my path. Suddenly I would notice people speaking Spanish around me or run into someone who just returned from Spain. 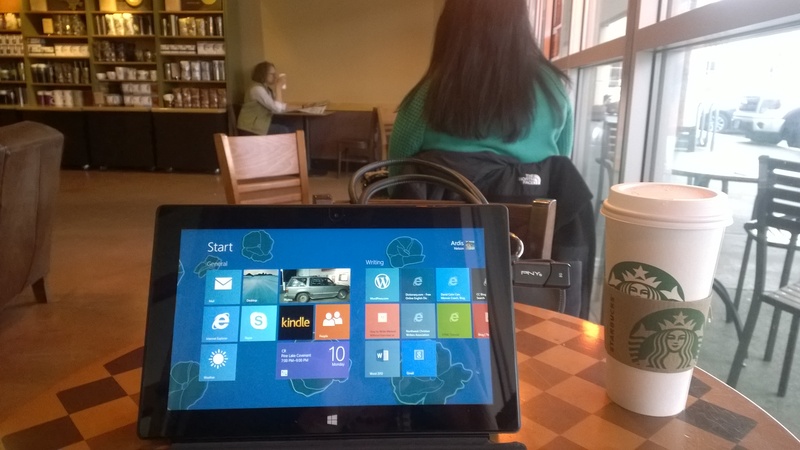 Case in point, just a few months ago while sitting in a Starbucks and reading an email from Rosa, Pedro’s mother, I noticed two women sitting next to me who were speaking Spanish. I was having a hard time deciphering some words in Rosa’s letter. She sends them to me in English (via an online translator), but sometimes the Spanish words don’t translate. So I decided to introduce myself to these ladies and ask for help. I’m so glad I did. One woman obliged to explain the translation to me. In turn I proceeded to get a better understanding of the language and why that particular word couldn’t be translated by the app—even when I tried. She was from Southern Spain, where I traveled last summer, so we talked about that a bit. It was wonderful to have this small connection over the country that I now hold so dear to me. 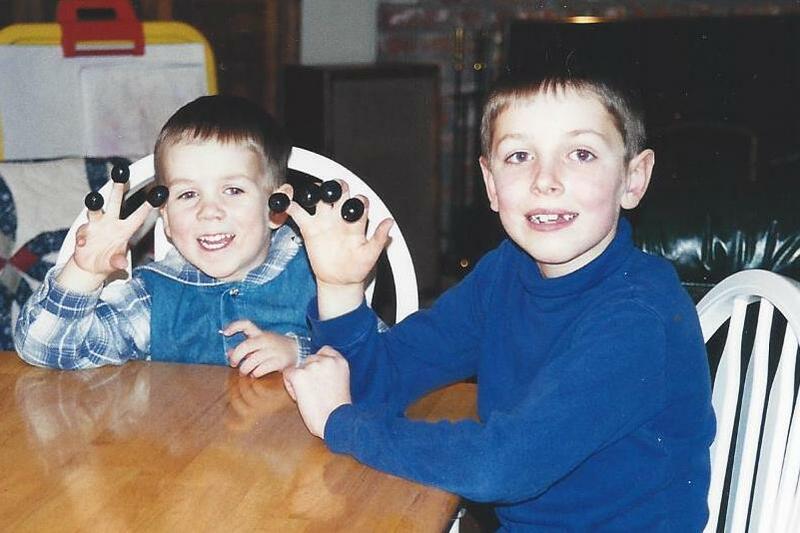 The world got even smaller for me recently though when my Spanish connections proceeded to intersect with my oldest son, Evan. He won a trip to Valencia, Spain on the ‘Magic The Gathering’ Pro Tour, where he would be participating in their next international tournament. That was when my real Spanish connections came in handy. Last summer while living and traveling with Pedro’s family, I met some of their family and friends who live in Valencia. I didn’t travel there myself, but we all met on the island of Mallorca where the family goes on holiday. These Valencian friends and family spoke very little English or none at all. Unfortunately that limited my direct conversations with them, but we did spend time together on daily outings to the beach or at parties. Our daily beach hang-out with my Spanish friends on Mallorca. Language barrier aside, I proceeded to communicate with my Spanish friends with the use of an online translator, like I do with Rosa, and told them of my son’s upcoming travels to Valencia. These people graciously showed my son around Valencia, took him out to eat, and even invited him to a family birthday celebration at a farm home outside of town. I was tickled pink to receive photos via Whatsapp (free international texting app) of my son’s time with them. The only disappointment I had with all of this is that Evan and Pedro couldn’t connect. 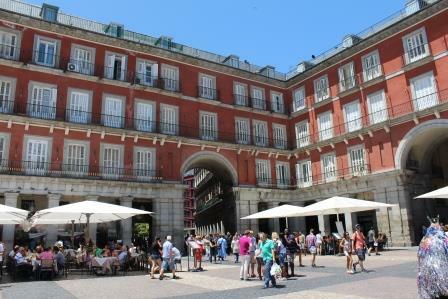 Evan traveled through Madrid and had a long layover, but their schedules just didn’t coincide. 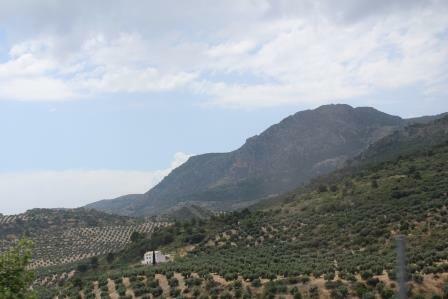 I’m pleased that I can now share some of my son’s photos from his adventure in Spain. Special thanks go to my Spanish family for immersing my son in their culture and for their generous hospitality. Is it really a small, small world? Or is it because we have such a big, big God? I’ll let you decide for yourself. I’m just pleased that my world keeps getting smaller and the possibilities greater. At the beginning of the year, I crossed another item off my bucket list—well, sort of. I’m a big fan of the film The Sound of Music. My actual bucket list item would be to take the Sound of Music tour in Salzburg, Austria, where the movie was filmed 50 years ago. But since that is fairly unlikely, I did the next best thing. 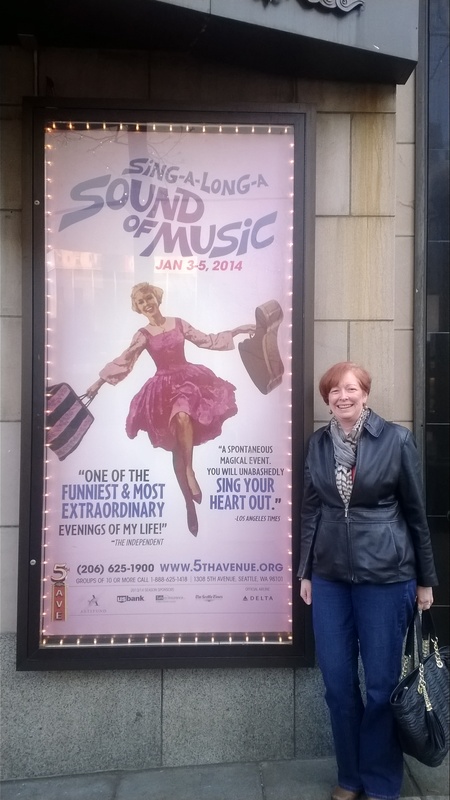 I attended a Sound of Music Sing-A-Long at the 5th Avenue Theater in Seattle on New Year’s weekend. What is a Sound of Music Sing-A-Long? I first heard about this event from the special features section of my Sound of Music DVD. They showed a sing-a-long at the Hollywood Bowl in California. People dressed in costumes and participated in various sing-a-long theatrics while the movie was showing (similar to what is done for The Rocky Horror Picture Show). It was a comical idea, but I didn’t think I’d ever actually go to one. 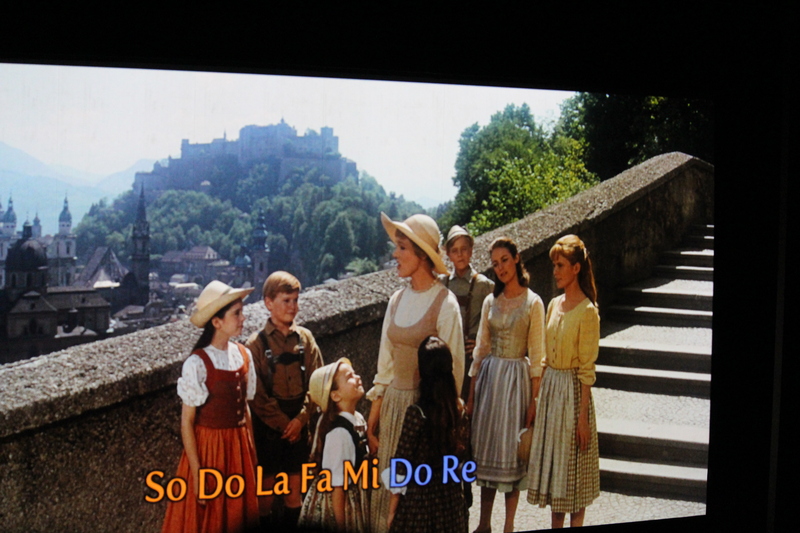 Then last fall when I wrote The Little Girl Inside, a post about the significance of the Sound of Music to me and how it intersected with my trip to Spain, I searched for the sing-a-long event online. I filed the Seattle event away mentally, not sure if I could free up the time over the holidays or who would want to attend. As the days quickly passed toward the New Year’s weekend, I vacillated between going by myself, inviting others, and not going at all. I ended up going by myself, and I’m so glad I did. I didn’t quite know what to expect at the event. I was having a rough time emotionally over the holidays and didn’t know how I would react to the production. I wanted to experience it privately, so to speak—or at least to be anonymous in the crowd of strangers. It was such a memorable event in so many ways. What happened at the Sing-A-Long? 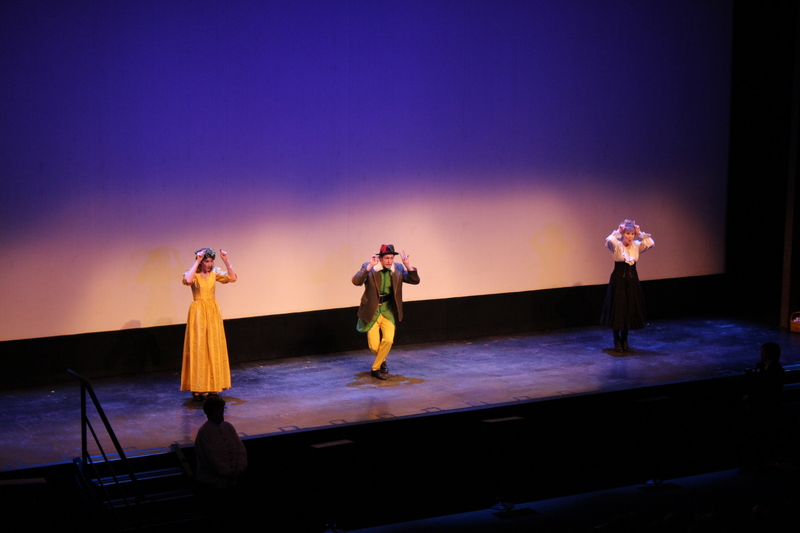 When I arrived at the theater, I immediately saw people dressed up for the costume contest. Thankfully they were in the minority. There were nuns, people dressed in lederhosen, children dressed as the Von Trapp family, etc. The contest preceded the movie. Before the movie started an announcer appeared on stage to give us instructions on how to use the goody bag items during the movie. This was not a passive movie-going experience. And you weren’t expected to just sing, you were to interact with the movie at prescribed times as well. The announcer and his assistants demonstrate gestures for “Do, Re, Mi”. For the Nazi’s, we booed. For Rolf, the love interest of Liesl, we barked like a dog, “ruff, ruff”. For Baroness von Schraeder, we hissed. And every once in a while someone in the audience would shout out a humorous remark. There were other ways that we interacted with the movie as well, but I won’t spoil it for others who may opt to go in the future, which I highly recommend doing. 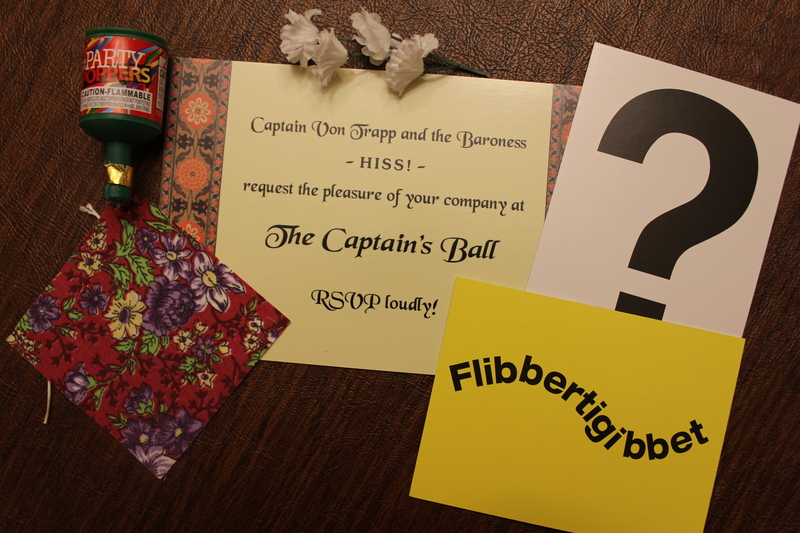 an invitation to the ball, a party popper for the ‘big kiss’, and flash cards. For me the best part of the event was the opening scene of the movie. It started out with the announcer making comical comments and shouting to Maria, but his antics were quickly overshadowed by the grandeur of the movie. I was lost in the moment as the song naturally flowed from my lips in perfect sync with Julie Andrews’ glorious voice, and the voices of over 2000 other enthusiastic movie fans. A few tears were shed as I was overtaken by the magic and emotion of this sentimental memory from my childhood. At the end of the song, the theater burst into applause, which they did after every song just like it was a live performance. If you’ve never seen the movie, or you want to experience the opening scene from a sing-a-long perspective, watch this short video. The lyrics were highlighted word by word for each song in the movie. A buried part of me came alive when my mother passed away three years ago; and music was a part of that awakening. I encourage you to find the hidden treasures that are buried within you as well—the little creative things that give you joy. When you do, embrace it as a special part of who you are. And maybe like me, you’ll sing once more. Obviously the Spanish language was another major change for me to adapt to during my six-week trip to Spain. The one regret I have about my trip is that I didn’t spend more time learning the language. I think it would’ve made a big difference—especially in group settings. Back when I was in high school, most colleges required two years of a foreign language for admittance. So that was exactly what I took—the 2-year minimum, in Spanish. Nowadays, most universities are requiring three or four years. I would’ve hated that at the time, but in hindsight, I can see how two years of a foreign language is not enough to really communicate. After all, when Pedro first arrived at our home, he already had eight years of English behind him. ShortcuttoSpanish.com, my favorite online study tool. Over thirty years after my high school language classes were completed, I came face to face with the reality that I was going to need to speak Spanish for my summer travel to Spain. I spent three months in advance of my trip listening to Spanish audio CDs and studying the language. With that, plus a translator app on my mobile phone, I hoped and prayed that would be good enough. A true exchange student is normally immersed in their new language without much opportunity to speak in their native tongue. That was not the case for me. 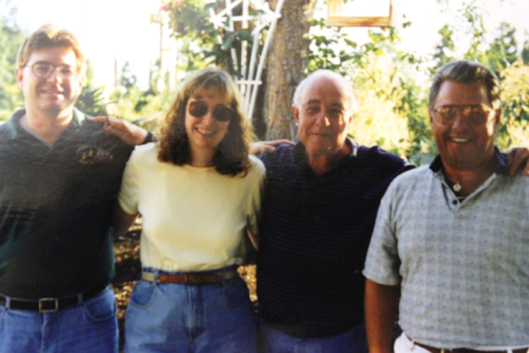 My Spanish family was very accommodating of my language deficiencies as they all spoke English to some degree. My biggest challenge was communicating with Rosa, Pedro’s mother. She had an English tutor for the last year to help her prepare for my visit. Although our initial communications were somewhat clumsy, her English was surprisingly good. 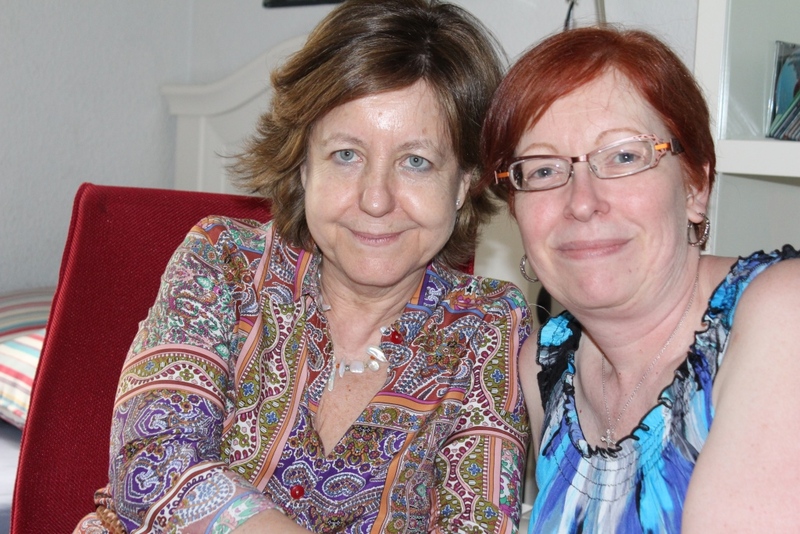 We both relied on electronic translators to help us fill in the gaps. 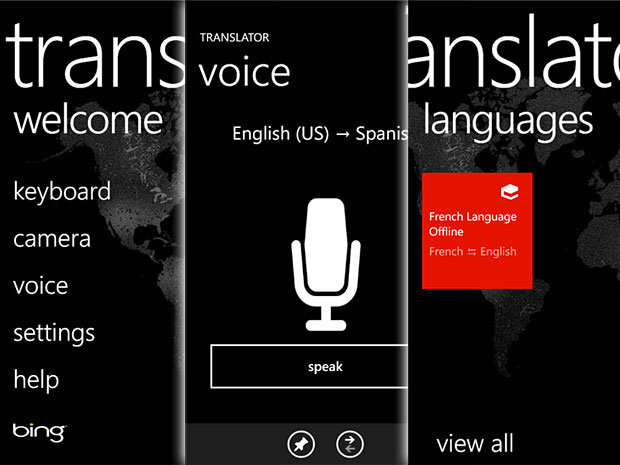 I would’ve been lost without my trusty Bing translator on my Windows 8 phone. 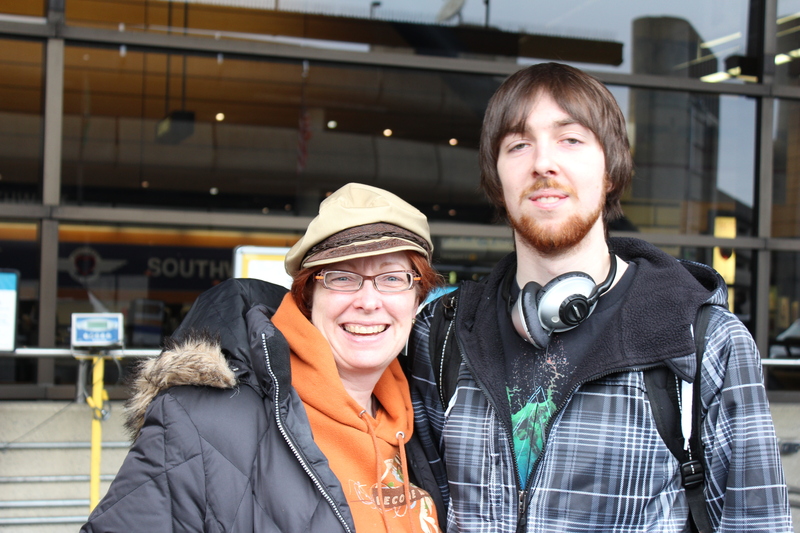 Early on in my trip, I embraced the language and tried to communicate with my family in Spanish. I wanted to learn the language. I know I butchered it at times, but was rarely corrected. They knew what I was trying to communicate. I eventually limited my trying except for some basic phrases that I routinely needed. While everyone spoke English with me, all other conversations were in Spanish. Prior to my arrival in Spain, I hadn’t given that much thought. I knew the household would be a mixture of Spanish and English. It was rather disorienting to live in a home and an environment and not understand what was being spoken around me. Of course, I asked at times or was filled in occasionally, but over time, I think it started to wear on me and fed into feelings of isolation. The truth of the matter is that not knowing the language myself limited who I could talk to, when I could talk, and what I could say. There were times I felt lonely and invisible—even in a room filled with people. The emotions around this totally caught me off-guard. Back in America, I would be able to process all of these feelings and cultural adjustments with a trusted friend or in a support group setting. While in Spain, I mostly turned to my journal and to prayer. 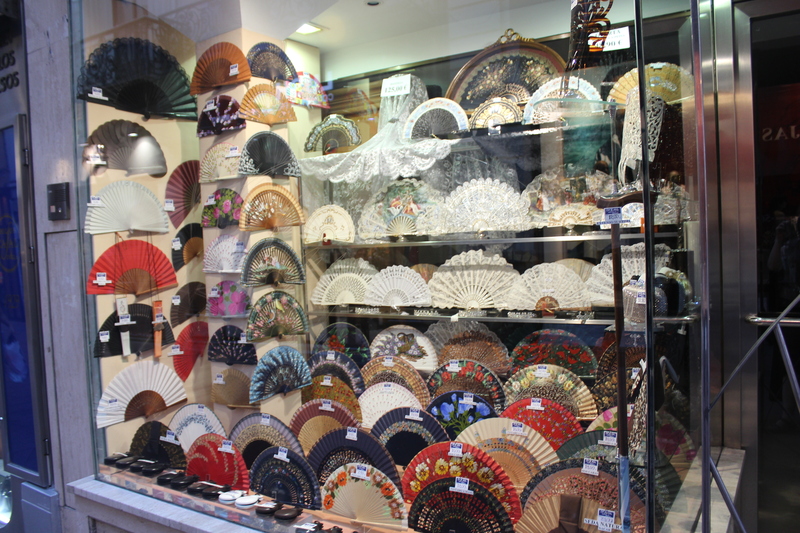 I was very grateful for the occasions when I was able to speak English for an extended period of time—like having Pedro’s uncle serve as my personal tour guide throughout Seville, befriending a young Mexican woman who spoke fluent English, or spending a Sunday afternoon with English speaking Protestants. 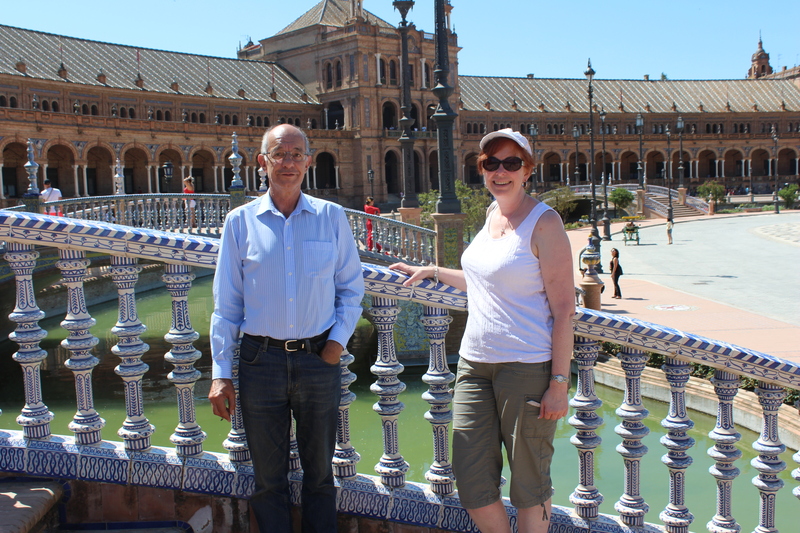 My own personal tour guide in Seville, Pedro’s Uncle Francisco. Rosa also mixed up the English words “kitchen” and “chicken” early on. We never let her forget that mistake and reversed those words in our future conversations. That led to Pedro and his father trying to confuse me on giving directions—to the left (izquierda) or to the right (derecha). Our friendly teasing was always good for a laugh. 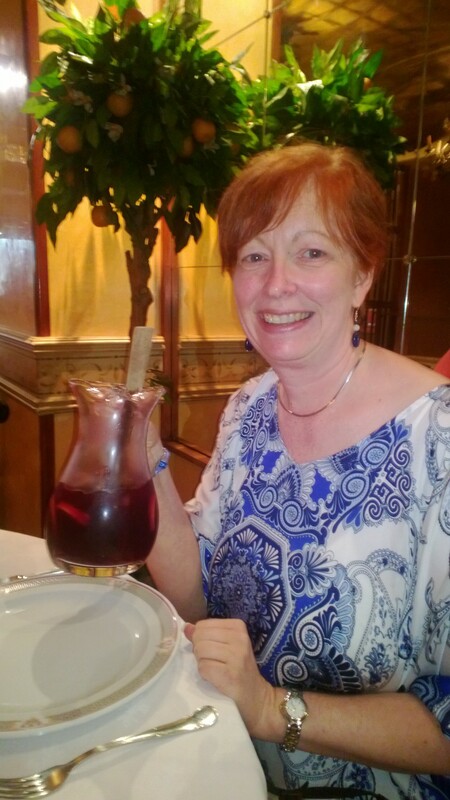 I loved how learning Spanish stretched my mind in new ways—even at my age. I loved how at times we all mixed the Spanish and English in our conversations. I enjoyed and was pleasantly surprised at how quickly my mind started to think in Spanish, and sometimes subconsciously in my dreams. Pedro and his family commented several times how much my Spanish had improved over the course of my visit. I was just as surprised, although disappointedly so, that it all disappeared as soon as I was back in America. 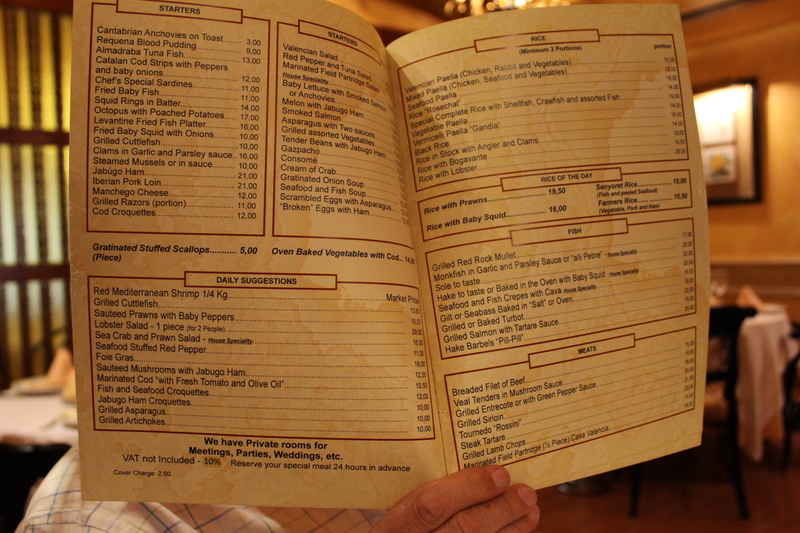 Many restaurants had bi-lingual menus, like Casa de Valencia in Madrid. I have logged dozens of hours of Skype calls with Pedro since we met. Not once did I ever feel like I needed to learn Spanish. What I learned about the language from all of this isn’t really about the Spanish words or the grammar. It is that we truly do live a world apart, and the language, no matter how much I learn, will always be a barrier between us to some degree. I also learned many things about Spain, my Spanish family, and about myself on this trip of a lifetime. After two weeks back home, I am still processing much of it. 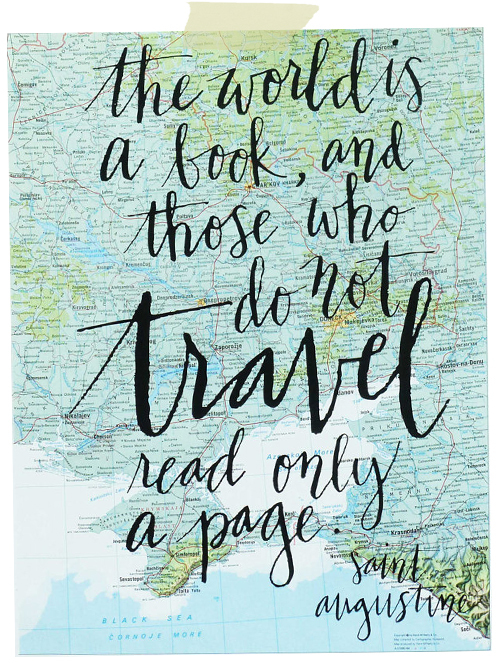 One thing is for sure, I would not take learning the language so lightly for a future trip. ~ If this is your first time visiting my blog, you can start reading about my Spanish travels here. To read the next update in this series, click here. 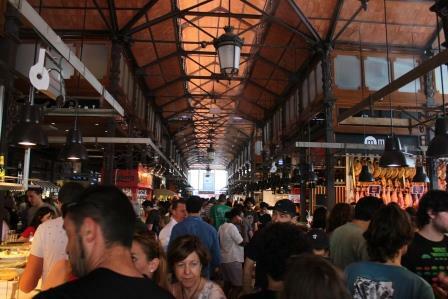 Like other Mediterranean countries, the Spanish lifestyle is steeped in tradition—from the pace of the day, to the food they eat, and more. It is so very different from America. Living with my Spanish family has given me a bird’s eye view into the typical Spanish home. Thanks to hours of Skype calls and dozens of emails with Pedro and his family over the past three years, I knew a lot about the Spanish lifestyle and culture prior to my arrival. I was ready to blend right in—or so I thought. For all of the prep I did, language, exercising, dieting, etc., the one thing I didn’t consider was my hair color. With my red hair, it is like I am wearing a sign that says “Soy Americana.” Other than that, I am doing everything in my control to live like a Spaniard. Here’s an idea of what that is like. 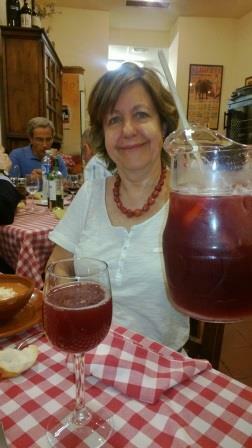 Standing out with my red hair and enjoying the laid back lifestyle Spanish style (with Sangria). 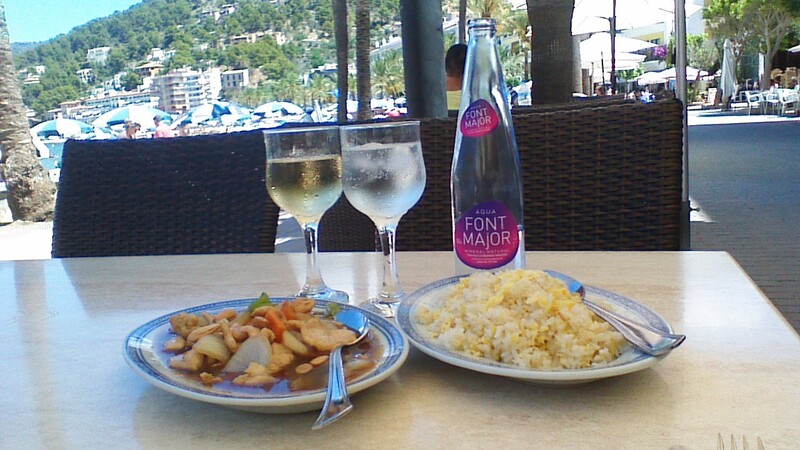 The Spanish lifestyle is much slower paced than in the U.S. However, my personal pace of life has been very hectic as we tour parts of the country and sightsee almost daily. 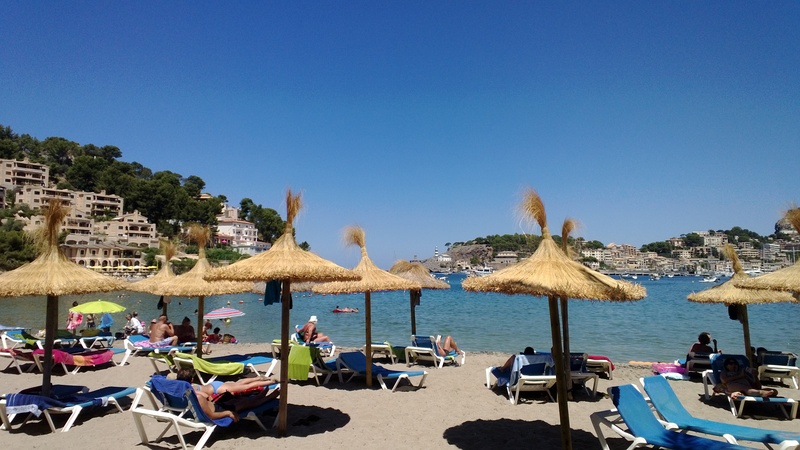 The Spanish are hard workers, putting in a full day’s work, from 9AM to 7PM, but also fitting in a long lunch for the traditional summer siesta. In the summer, families usually take a month long holiday (vacation), like I am now. 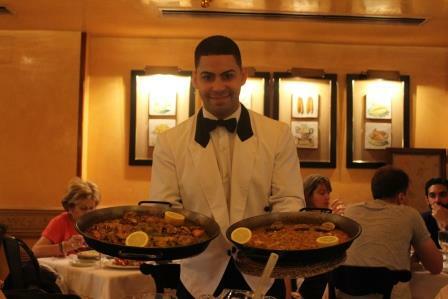 The Spanish pace of life revolves around their scheduled meal times. With no set time to wake up in the morning in my family, breakfast (desayuno) for each of us has been on our own. 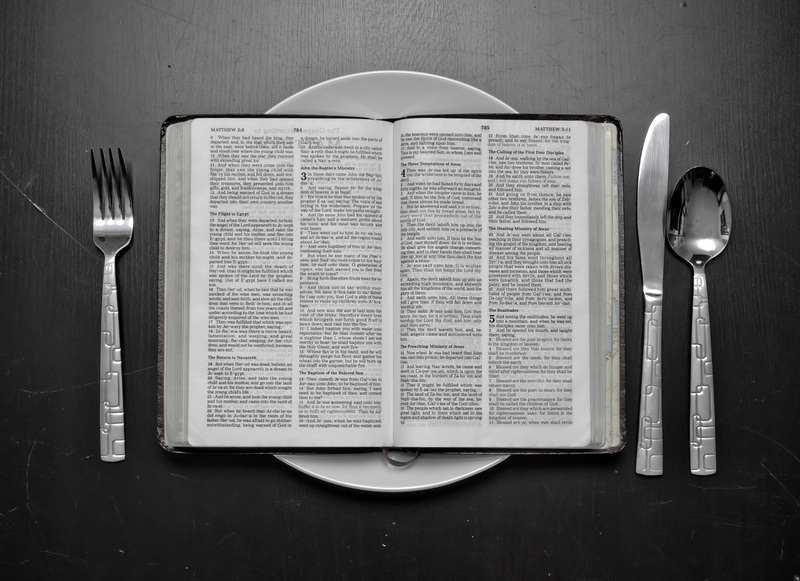 The mid-day meal, lunch or almuerzo, is generally at 2:00 in the afternoon. Unlike America, lunch is the main meal of the day. It is served in courses, with all family members finishing each course before moving on to the next. Rosa wheels a cart with the family dinner to the dining area. With a big mid-day meal and an uncomfortably hot summer climate, the traditional siesta is definitely in order after lunch. In America, I usually get a bit drowsy after lunch, but I fight the urge because I always have so much to do. Before I arrived in Spain, Pedro asked me if I was going to participate in the Spanish tradition of siesta. I laughed and told him I was planning on writing during the daily siesta time. He jokingly told me the siesta is the best invention since electricity. And now, four weeks later, I have to agree; I love the siesta. Sadly that means my writing has suffered. 30 minute siesta to rest and rejuvenate. When I awake from my siesta, I feel refreshed and ready to continue on with my day. The siesta splits my day in two and makes me feel like I fit more into the day. The next several hours of the day are always very productive. While in Madrid I tried to spend this time of the day with Pedro working on music projects or we would go out exploring. When was the last time you answered your body’s call for an afternoon nap? The equivalent in America would be the power nap—a rare luxury—something I am seriously considering instituting when I return home. In America, the late afternoon hours are a sign of the end of the day. In Spain, there are still many more hours of productivity left in the day. 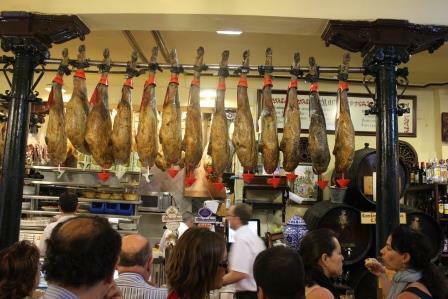 Outdoor seating is common at restaurants in Spain. For the young, or young at heart, the night is still early. Many nights Pedro would go out late with his friends. 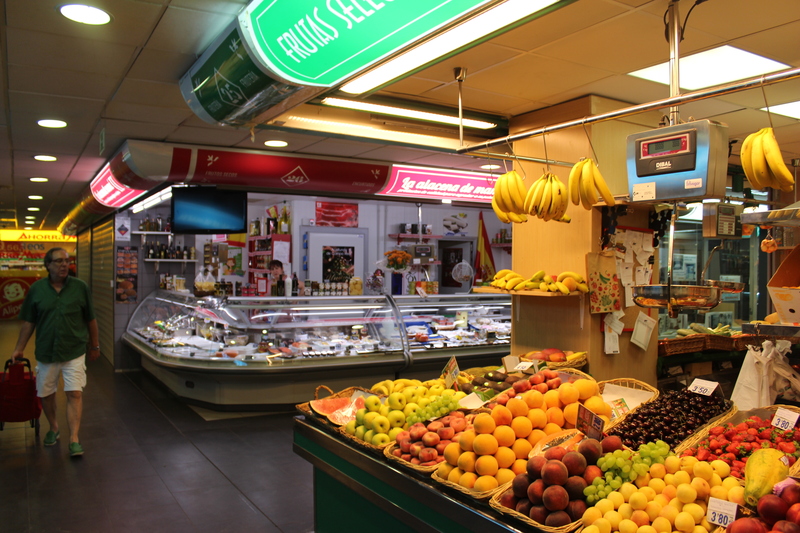 I have experienced a few late night evenings while traveling in Spain with Pedro’s family. 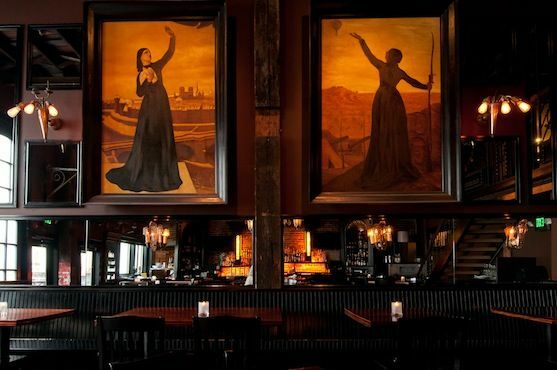 I haven’t experienced the disco or bar scene per se, but I have been privy to the familial connections that transpires at these outings. They aren’t necessarily drunken parties that the American news channels love to exploit. 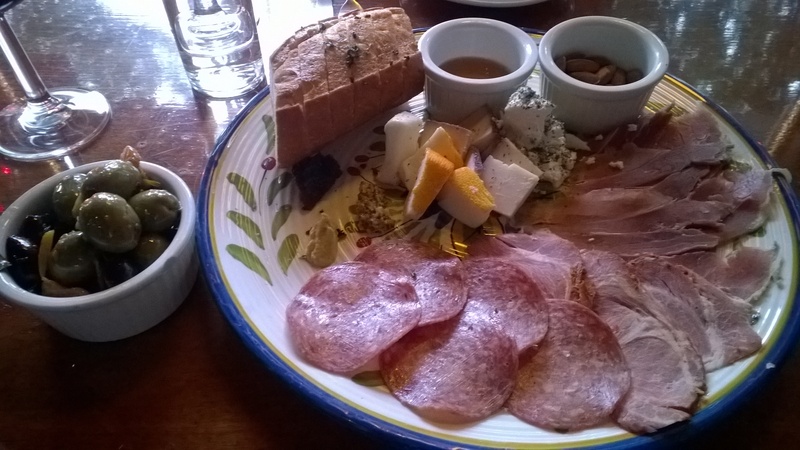 They are times to relax with friends and family over a light and long leisurely dinner, usually tapas (appetizers), and drinks. 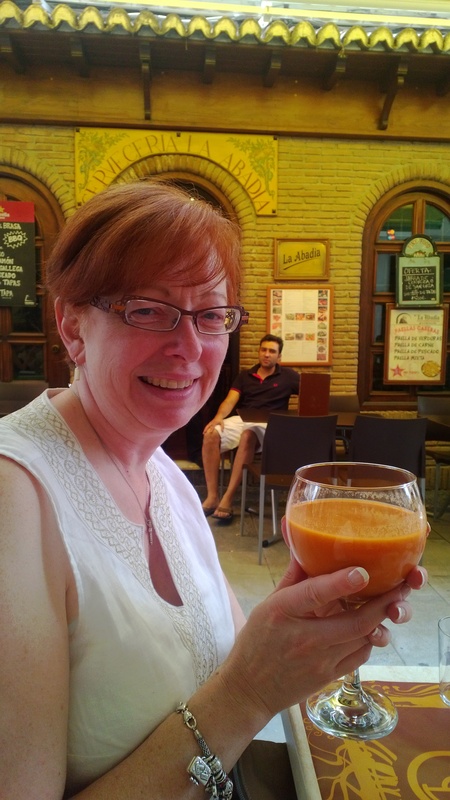 Today’s post marks the end of four weeks in Spain. My time on the mainland is now complete, leaving Madrid and Pedro’s piano behind a few days ago. I have captured nearly 3,000 photos on my adventure. 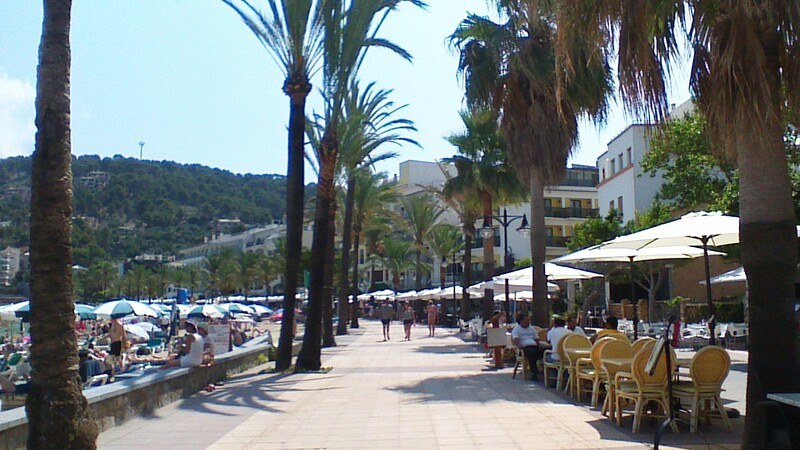 I am currently on Mallorca, an island off the coast of Spain, on holiday with my family. I will return home directly from here two weeks from today. ¡Hasta la vista! I knew that dealing with a 9-hour time difference and jet lag would be a difficult process. I had watched Pedro do it twice before when he visited our home. Both times he was a real trooper, immediately attending welcome parties and staying up late on his first night in America to do a gift exchange with our family. During the first few days of my stay in Spain, several times Pedro said to me, “Now you know what it felt like for me. It was horrible.” And now I agree. Actually I think I did quite well, all things considered. I managed to get 30 minutes of sleep, basically a cat nap, the night before I left. When my alarm clock went off at 3:15 in the morning, I felt ready for the day. I had dreamed of this day and meeting Rosa many times in the months, weeks and days preceding my trip. I hoped for lots of sleep on the plane and knew my adrenaline rush would get me through the day. 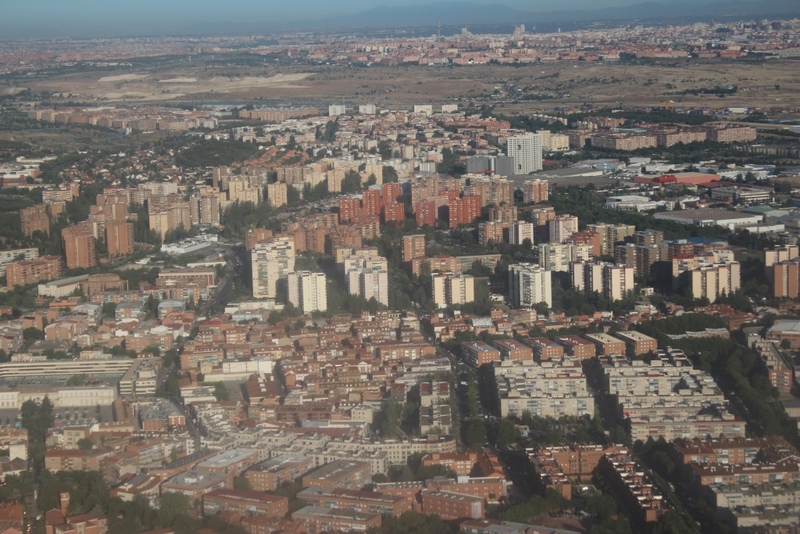 Approaching Madrid from the air. 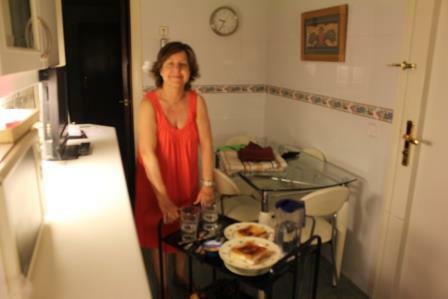 The flight and my first days in Spain are a complete blur in my memory. What I can clearly recall is that it felt like the longest day of my life—and it was. 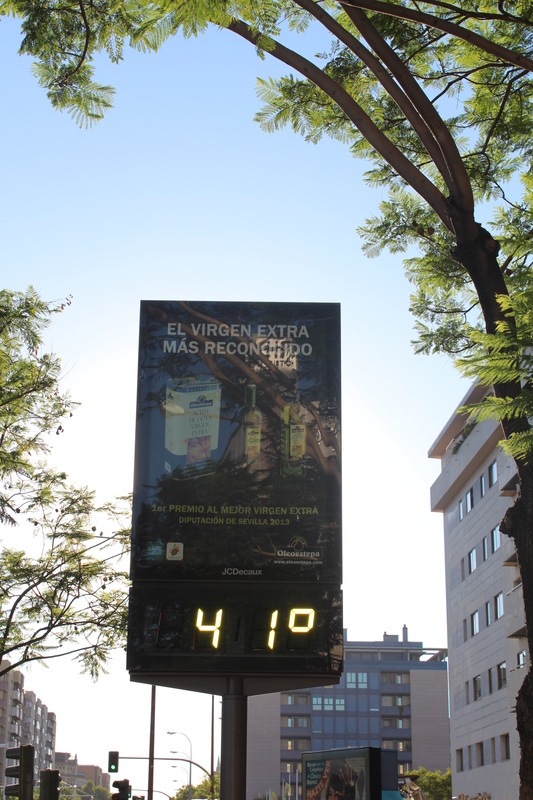 By the time my head hit the pillow for my first night’s sleep in Spain, 40 hours had physically passed. 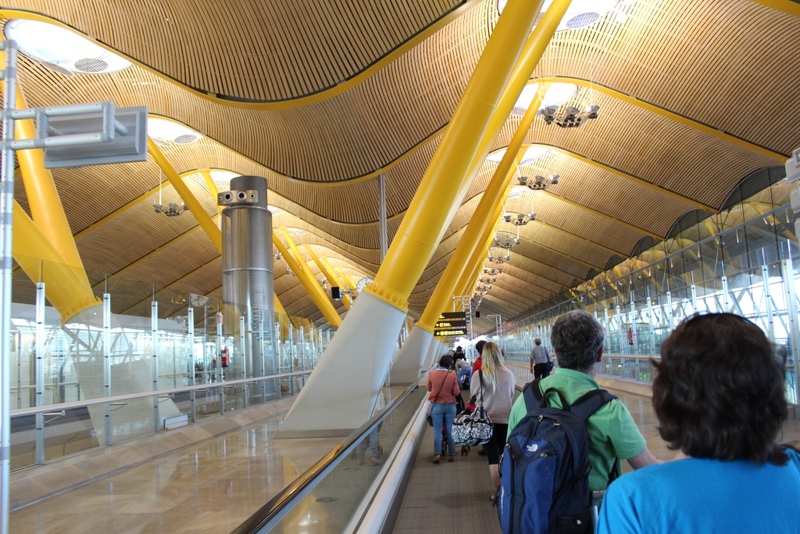 The anticipation grew as I negotiated the Spanish airport signs, long corridors and what seemed like an eternity waiting for my baggage to slide down the carousel. I expected long lines to get through Customs as well, but the agent barely gave me or my passport a second look. I was so excited to communicate my first Spanish words to someone—even just a passing “Hola” or “Buenas dias” would’ve been enough to confirm I was on Spanish soil. But no, he was just pushing paper and not at all interested in the journey I had physically, emotionally and spiritually traveled to get to this time and place. With Customs cleared and baggage dragging behind me, I knew my next stop, per se, was connecting with Pedro’s family. More importantly, it was meeting Rosa face to face for the first time. My camera was ready in hand and somewhere in Madrid’s Barajas International Airport, Rafa, Pedro’s father, was waiting with his camera perched to capture this moment for me. The only problem was I had no idea around what corner we would meet. And then it happened. A large set of opaque sliding glass doors opened wide to reveal a group of people standing behind a gated area. I heard cheers and saw smiling faces. I think I even heard my name; and then I made visual contact with Pedro and his family. Rosa was definitely excited. She was shouting my name in her thick Spanish accent and didn’t let the metal barricade keep her from rushing up to greet me. I reciprocated with the standard European hug, a cheek kiss on both sides of the face. All of our initial words and greetings are now gone from my memory, but the excitement of those first moments are still lingering. When I got to their home, all I wanted to do was eat and go to sleep, but travelers are recommended to get on the new time zone by forgetting the time difference and embracing the current hour of the day. My body knew it was after midnight back home, but at my new home the day was just starting. Ay, (Spanish for ‘oh my gosh’)! I dreaded the thought of getting through this day without sleep. 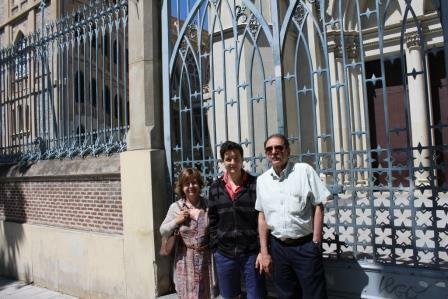 Pedro and family outside his former school. My host family did allow me to take my first siesta later though. It was sandwiched between two walks in the neighborhood. On our first walk I was delighted as we toured the Catholic school Pedro attended from 1st-12th grade. The halls were lined with the framed first communion photos from previous year’s classes. What a treat to see Pedro’s young face and proud moment plastered on the school wall along with some of his friends, who at this point I only knew by name. Our second walk was to Retiro Park, similar to Central Park in New York City. I found my first geocache here—one I remembered Pedro telling me about two years prior. Now it was my turn to “log a smilie”. That’s geocaching lingo for finding a cache. My camera, and my feet, got a real workout on both of my outings. 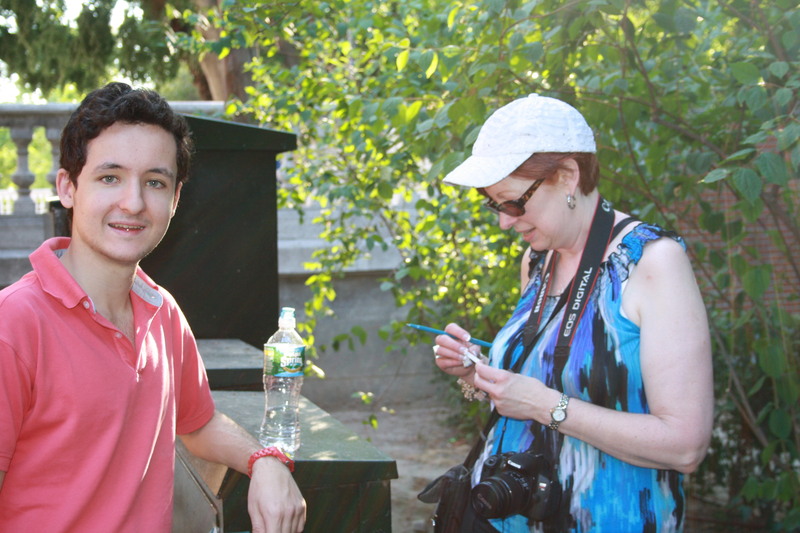 My first geocache in Spain, Retiro Park, Madrid. The real highlights of this longest day were the heart connections that confirmed my love for this family and why I traveled around the world to be here. 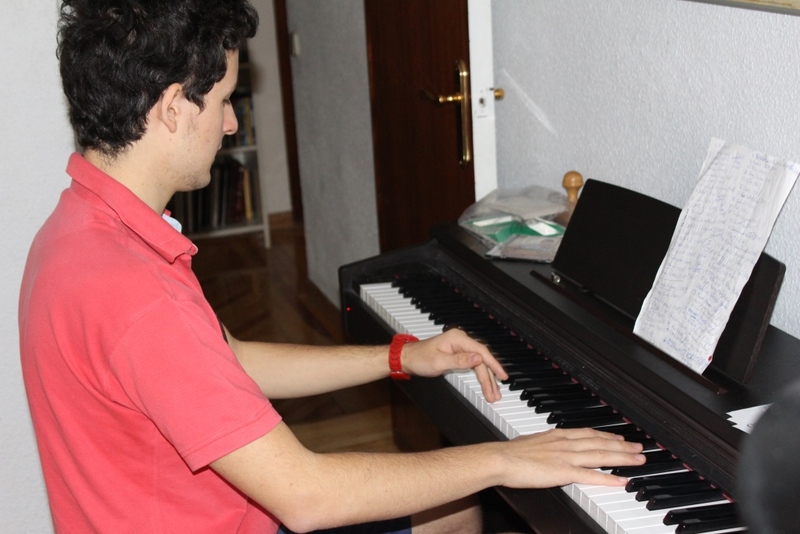 My first was watching Pedro play the piano minutes after my arrival to their home. No words could describe the pride and joy that filled me in this moment—three years in the making. And then when Rosa joined us, well, the tears naturally came too. Later in the day when I awoke from my siesta, Pedro’s music was filling the flat again, and my senses. Rosa and I had some quiet time together with his music playing in the background. It was all so surreal to me, like a movie soundtrack was playing in the background. It was priceless. 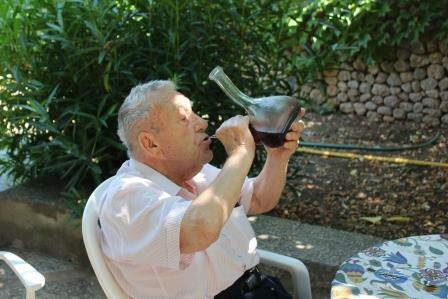 After 12 days in Spain, I have adjusted to a new way of living and my beloved Spanish family. What I haven’t adjusted to though is how and when to write. I originally thought I’d be writing during the traditional siesta time, but I have fallen in love with my siesta. Today I have foregone it to finish this post that was started days ago. There is so much happening, so many sights, and so much emotion. I am pushing myself hard to keep up with all we are doing. What my mind and fingers don’t have time to capture on the computer, my camera is capturing ‘on film’. That is enough to keep me writing and blogging back home for the months to come. I am sending much love to my family and friends back home and beyond who made this trip possible. It is a dream come true. It is especially for them that I am writing today. Tomorrow I will siesta again. Rosa & me beaming over Pedro’s music and the delight of finally meeting.